Computer Science & Engineering department has gained remarkable reputation through continued efforts in imparting quality education since 2003. Department runs both graduate and post graduate programs. During graduation besides learning courses in basic sciences, students go through the broader study of information algorithms for software designing for use in Industrial Applications. The core courses provide strong foundation in the realm of real and abstract computing devices. Department has excellent. faculty and state of arts, labs for study of methodology and theory for computing and their application like algorithm, complexity, machine instructions, artificial intelligence and others. Special focus is given to System aspects and Hardware oriented topics like Computer Architecture, System level Hardware Design, Operation System, Databases, Parallel and Distributed Systems, Soft Computing and Embedded Systems. At the post graduate level programs, the department has holistic approach in teaching the advance concept which are applicable for solving problems at higher level in Industrial Organizations. Other advanced subjects such as object oriented designing, Network Security, Cryptography, Data Ware housing and Data Mining etc. are also taught to the students. Department has more then 40 faculty members, most of them with Masters and a few with PHD degrees. In the department, there are more then 700+ Computers with adequate number of printers and five Blade Servers each with dual XION Processors, maintained in 14 different Laboratories with all the prescribed software and other application oriented software totaling more then 42 in numbers. Faculty is deeply involved in preparing latest teaching learning materials, Lab Manuals and conducting academic research. Faculty has significant number of Publications and is involved in many industrial Projects. 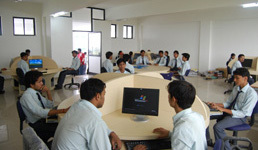 Due care is taken in making students complete computer engineers. For this depth and breadth of coverage of each course is minutely scrutinized and where ever necessary syllabus is supplemented by additional topics beyond the syllabus. It is always ensured that the basic objective of the program are properly mapped on the outcome (Graduate Engineers). As a part of our systematic delivery approach towards pedagogical and archeological excellence, the innovative interactive teaching learning process is adopted synthesizing the conventional learning mechanism such as lectures, lab sessions etc. Our methodology includes student seminar, guest lecture industrial interactions, tutorial and assignments and total personality development.